Are you wanting to enhance your journey as you walk the Camino de Santiago? Do you want daily encouragement and feel the need for inspiration on this spiritual path? Then, Step by Step, is the book for you! Feed your soul with this 33 day devotional and journal. These daily reflections will encourage you toward prayer time and help you to quiet your mind, open your heart and listen deeply. As you walk along this prayerful path, Step by Step will open your heart to the beauty within. And then, most important, encourage you to move forward, true to the spirit of loving kindness and compassion deep in your heart. This wonderful book is small and lightweight, perfect for your backpack. Within this book you will not only find a devotional and journal but lots more. We have included a little of the history of the Camino de Santiago, it’s rituals and traditions, along with different ways of prayer that you may enjoy practicing. Step by Step has only one goal, to enhance your journey through prayer and meditation. Step by Step gives you a place to log your dates, distances and more. Each day starts with a reflection, a quote and a page for journaling. Thinking about the pilgrims who will be walking a little longer, remember everyone walks at their own pace, we added a few extra reflections and journaling pages. Upon completion, we have “our journey home” pages… prayers and thoughts about leaving this spiritual time and coming home. Or as some say, “coming down from the mountain.” Hopefully, the world will not intrude to heavily, but if it does, the lessons and awakenings of your Camino walk will always be at your beck and call. Always only a prayer away. You have been walking with the Divine presence and the afterglow of those days will never leave you. God has made it so. Remember this journey is yours and yours alone. 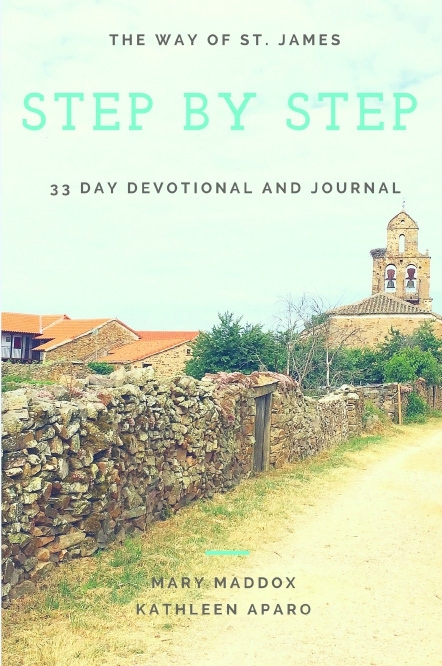 Journal your way along the Camino, Step by Step! Write your story.